So first things first….the title of this article is misleading; thus far Avid do not seem to have released a sounds pack specific for Sibelius 8 as you will see on the website when you login in (https://my.avid.com/account/orientation) the only option is for the 7.5 sounds pack. But…this works! Now deploying Sibelius it’s self in a silent manner is (in my opinion) pretty well documented at this link – http://avid.force.com/pkb/articles/en_US/how_to/en396971. When you get to the sounds the documentation (again in my opinion) (which can be found here – http://avid.force.com/pkb/articles/en_US/How_To/Installing-and-using-Sibelius-Sounds-across-a-network) is flaky at best not to mention the confusion around version 7/7.5/8. For example the install path is listed as C:\Program Files (x86)\Avid\Sibelius Sounds\Sibelius 7 Sounds, well Sibelius 8 is x64 only so do we put it in the C:\Program Files folder instead? The registry entry is listed as HKEY_LOCAL_MACHINE\SOFTWARE\Avid\Sibelius Sounds\Sibelius 7 Sounds\ContentPath – well again do we update this to be ‘Sibelius 8 Sounds’? For quite some time now I’ve been a tad baffled about why the correct homepage settings are not being applied to users through group policy on first time login on recently deployed PCs. Quite often instead of reaching our intranet they are just greeted with the about:blank page. A gpupdate /force fixes the issue quickly however naturally this is not a viable solution. The fix took me on a tour of the Internet eventually ending up on the Microsoft Technet Forum (link) with an unlikely but correct fix of applying the ‘Disable external branding of Internet Explorer’. You might (just like I did) instantly ignore this possible fix as you are a IT pro – you downloaded a copy of Windows 7 Enterprise from the Volume Licence Service Centre and deployed it using MDT/WDS/SCCM so where on earth could the external branding come from? PS – A little bit more thought later on lead me to believe that it was indeed because I was using the Microsoft Deployment Toolkit (MDT) to deploy Windows to these PCs and MDT was indeed set to use about:blank as the default homepage (see in below screenshot sequence). All the same this fix works and the group policy you are after can be found at User Configuration > Policies > Administrative Templates > Windows Components > Internet Explorer. The screen shots below show this in a little more detail. 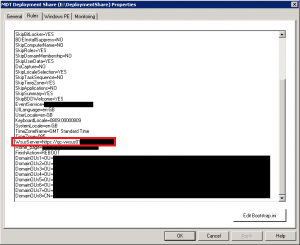 Using MDT and App-V to get PCs to users fast! This video shows how MDT and App-V can be used to get a OS installed on a PC (can use it with servers as well) in a very hands off way as well a quick over view of the key end user experience of App-V.